The European Handball Federation has been at the cradle of the international ONSIDE project, funded through the Erasmus+ Sport programme of the European Union. 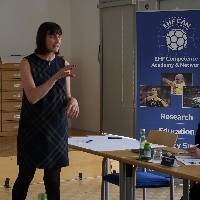 The EHF proudly hosted the first two-day gathering in Vienna on 11 and 12 April, which officially got the project underway. ONSIDE will, for the first time, explore the generic skills and competences of sport officials and develop new education courses relevant across all nations and sports in Europe. Led by the European Observatoire of Sport and Employment (EOSE) and Sports Officials UK, the project partnership has brought together European and national sport federations, a sports council, national Olympic committee and a university. Through the project the partners will implement the EOSE 7-Step-Model for workforce development and apply the model to the area of sport officiating. The project is aligned with EU policies in sport, education and employment, in particular promoting education in and through sport with a focus on skills development. The meeting hosted by the EHF ensured the partners are familiar with the methodology and work plan for the project, which will conclude in 2020 with a European conference on sport officiating. The ONSIDE project is co-funded by the European Commission under the Erasmus+ Collaborative Partnerships in Sport programme. A website for the project is under development and will be launched soon.